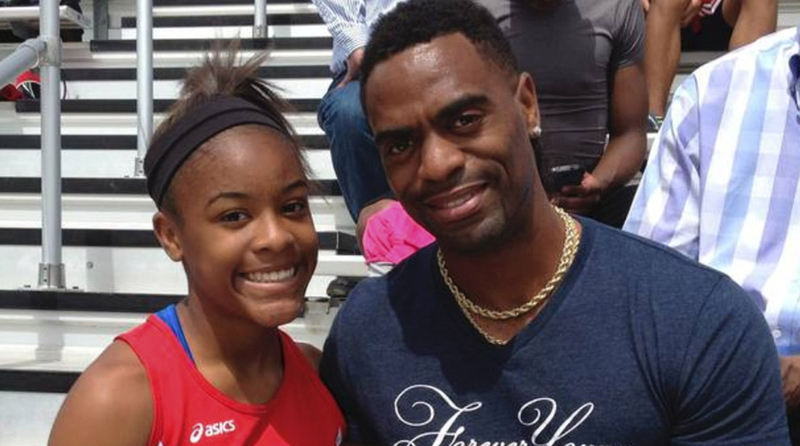 After a disappointing Rio Olympics and the devastating death of his daughter, Trinity, in a shooting in October, Tyson Gay is returning to the track to run in her honor. It was around 3 a.m. when Tyson Gay’s sister walked into his room at his home in Winter Gardens, Fla., to wake him. She had just received a call from her daughter: Tyson’s 15-year-old daughter, Trinity, had been shot. Gay checked his own phone and saw all the missed calls before he called his cousin Tim who confirmed the news and added that Trinity was in the hospital, near where the shooting took place in Lexington, Kentucky. About 15 minutes later, he received a call from her mother, Shoshana Boyd, who was hysterically crying on the other line. Gay knew what it meant and broke down in tears. In the early hours of Oct. 16, 2016, a shootout broke out among four men in the parking lot of a Cook Out restaurant in Lexington. Trinity and some friends were on their way to their car to avoid the incident when police say the 15-year-old was hit by a stray bullet. A blue Ford fled the scene but was later recovered by police. Days after, police arrested four men in the shooting. Chazarae Taylor was charged with wanton endangerment and murder. His son D’Markeo Taylor, and Lamonte Williams and Dvonta Middlebrooks were charged with wanton endangerment in the death. All four men entered not guilty pleas. Just months before the shooting, Gay’s focus was centered on the 2016 Olympics in Rio de Janeiro, as he prepared to run as part of the United States’ 4x100 meter relay team. But as the team crossed the finish line in Rio, celebrating a bronze medal finish with American flags draped on their shoulders, they were quickly brought to a halt. Due to a bad handoff outside of the changeover zone between the first and second leg, the team was disqualified. Then, weeks after returning home from a disappointing Olympics, Gay received that dreadful phone call. Trinity’s death made returning to the track that much for difficult for Gay. Gay was not one to push Trinity into running, or suggest that she follow in his footsteps, so he was surprised when she told him she wanted to pursue track seriously in high school. But Trinity never felt entitled to anything on the track because of her superstar father. She wanted to make her own name, so you wouldn’t see her arms up toward the heavens at the starting line or wearing multiple heavy gold chains like her father does, says Crystal Washington, the Lafayette High track and field coach who grew up in the area, raced Tyson Gay’s older sister, Tiffany, in high school and closely followed the American record holder’s professional career. Trinity ran personal bests of 12.15 for the 100 meters and 25.42 in the 200 meters. Washington believes that running in college was in Trinity’s future. Trinity had once mentioned to her father that she wanted to move to Florida for her senior year to train closer to him and explore her options of racing in college. After her death, members of the Lafayette track team found their own struggle to compete in the face of tragedy. Within two days of the shooting, close friends of Tyson and Boyd helped organize a candlelight vigil at the Lafayette High School track. Thousands of people attended the ceremony where track spikes hung on the metal fence surrounding the track. Tyson, wearing the same thick beard and gold chains that he donned before the world in Rio, made his first public comments and called for an end to gun violence. That night Tyson also said that he didn’t want to continue seeing more young people falling through the cracks and getting involved in violence. It’s a message that he repeated at her funeral on October 22, when hundreds packed Southland Christian Church to honor her memory. There was talk about her smile and positive attitude. As he prepared to run the 2017 outdoor season in her memory, Gay says he underwent counseling while grieving the loss, much like he’s done in recent years to deal with disappointments on the track. Earlier this month, the defense attorneys for the four suspects were granted until June 30 to file motions, according to local reports. Police say Taylor created the environment that led to the deadly shooting and his attorney requested that some of the statements made by him to police be thrown out as evidence. The defense attorneys also told local media they intend to file a motion challenging the sufficiency of the indictment, as well as a motion to get separate trials for the suspects. A trial date has not been set but could come when the hearing for the evidence suppression is held on June 30—one week after Gay competes at the U.S. Track and Field Championships in Sacramento. Gay has yet to determine whether he and Boyd will attend any of the trial proceedings, and he and Boyd are finalizing paperwork for a foundation in Trinity’s honor. Even though Gay hasn’t run a wind-legal time in 2017—his best was a 9.94 at a low-key race in Florida with a +2.2m/s gust—he’ll be on the starting line at Hornets Stadium at the end of June.